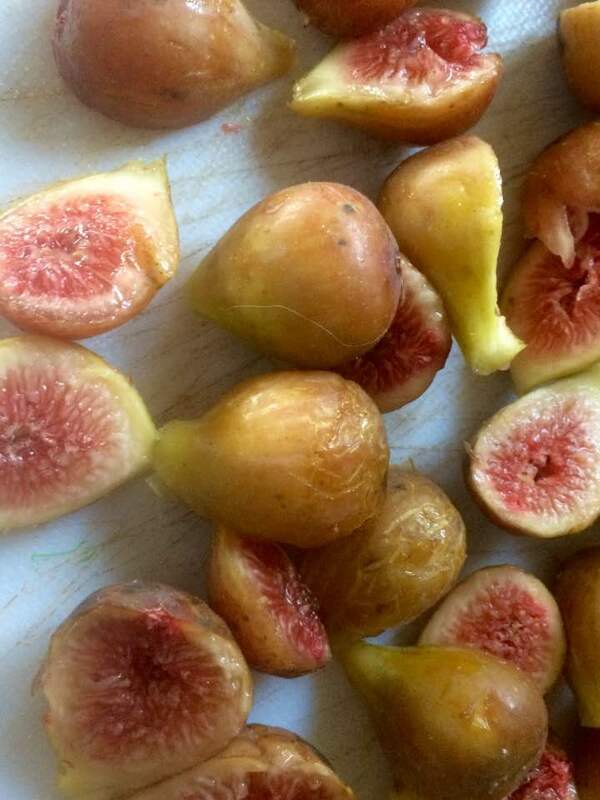 Don’t know what kind of figs these are but they’re pinkish-green when ripe, unlike the very brown Brown Turkey figs. We waited longer for figs than for a baby. The latter took just under 3 years; the former, more than 25. And this year, booyah!, we have figs. Figs to eat out of hand, figs to freeze for making preserves and figs to cook. Assuming figs grew in Eden (fig leaves, remember? ), why would anyone leave, ever? 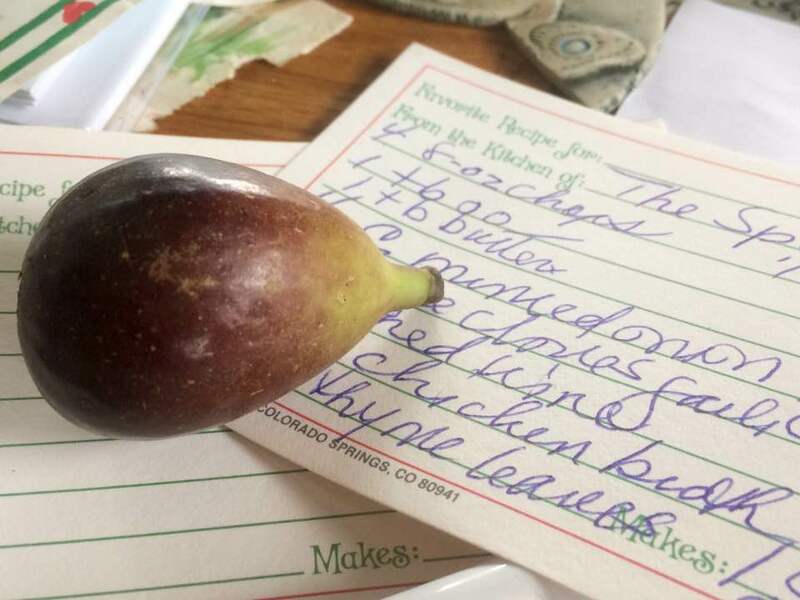 No matter what your best friend tells you, figs are fussy. About temperature (they don’t dig cold), feeding (they like it) and water (they like it a lot!). Figs are good in all sorts of baked goods and they and pork are a match made on Tinder. 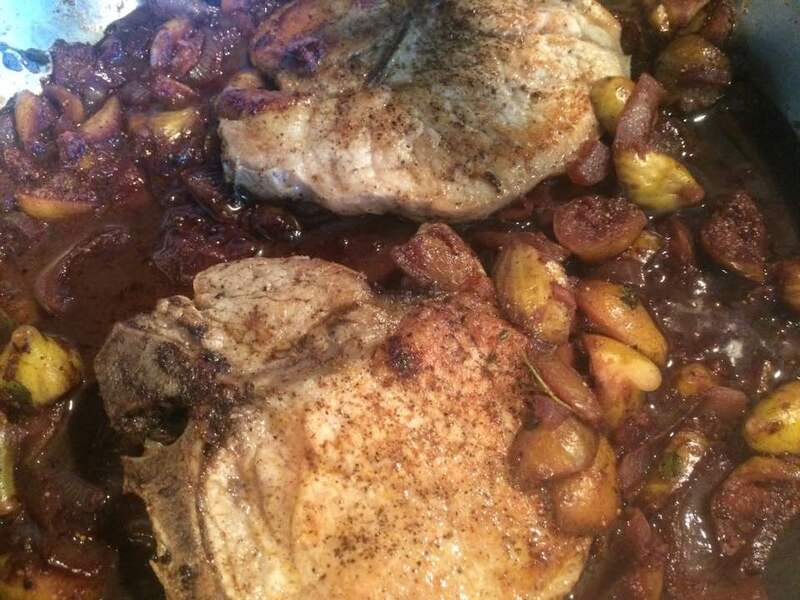 The figgy taste is a subtle one that doesn’t overpower the meat but somehow makes it more than when it was oinking around the barnyard. This lovely, easy entrée recipe came from a site called The Spruce. The only changes I made were to add more thyme (mine’s pretty anemic tasting this summer) and I bought chops 1/2 inch thick instead of pounding 8-ounce, 1-1/2 inch-thick chops to that thickness. Nobody needs to eat more than 3 to 4 ounces of pork at a meal and the 1/2-inch chops are easier to find and cheaper. Stoic and I agreed the sauce would be splendid on mashed potatoes. First and only Brown Turkey fig so far. Bring the chops to room temperature and rub with peppers and salt mixed together. Heat oil and butter in large skillet over high heat. Brown pork chops, turning only once, until golden on both sides. Remove to warm plate. Add onion and garlic to drippings in skillet and cook, stirring, until softened. Add wine and deglaze pan, scraping up yummy brown bits. Add wine, broth, thyme and figs and cook until it thickens and reduces. Rewarm chops in warm sauce, making sure each chop is generously sauced. The onions and garlic keep this sauce from being too sweet for the chops. Notice how the figs lost their color.